WOAH ! What happened to map 31 ? Some maps are only released as Patreon exclusive content. If you like my maps and would like to have access to all my creations. Consider joining our boat, backing me financially. You will get access to all the material in Hi-Def version. This is the first top-view area map I draw. I’m really happy with the result. The 1 km scale makes it very convenient to explore, even in a one-shot scenario, PCs can walk from town to town in a few hours. It lends perfectly for low-level work like escorting merchants from town to town. Exploring old ruins in the forests or mountains, working for the army in the fort and so on. Many of my other underground maps can be easily integrated here, for a full experience. 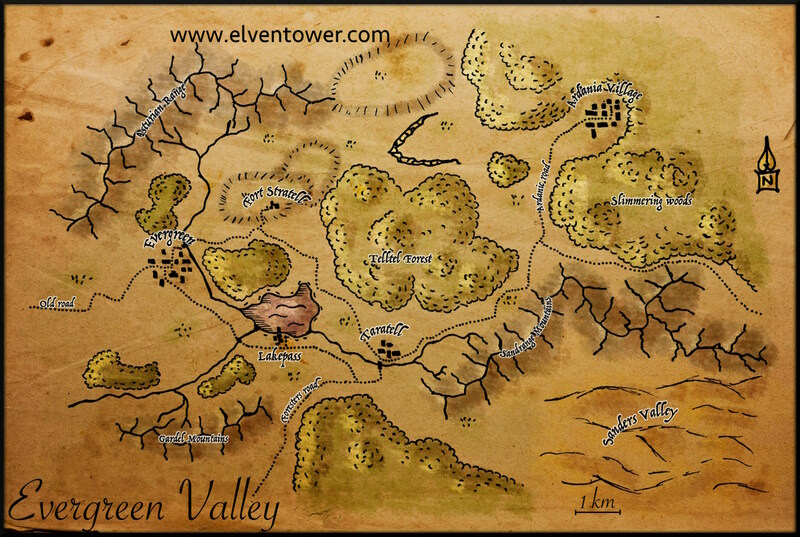 I have included two versions of this map in Patreon, one with name tags I invented. You can use this map when PCs visit a new area. Another version of the map has no tags, in case you want or need to use your own area names, depending on your campaign.